STRAZORS.com - all about classic razors - Joseph Allen & Sons, Sheffield. Joseph Allen & Sons, Sheffield. The founder of the company was Joseph Allen, the son of a sickle maker, who had been born in Dronfield in about 1829. By 1851, Joseph had moved to Sheffield and had been trained as a razor smith, but was working as a servant. He then worked as a razor smith in New Edward Street(1861) and a "razor back forger" in Rockingham Street(1871). By 1881, he was living in Solly Street and employing ten men, with his address by the late 1880s as Oak Works, New Edward Street. Allen built a reputation for his hollow ground blades. 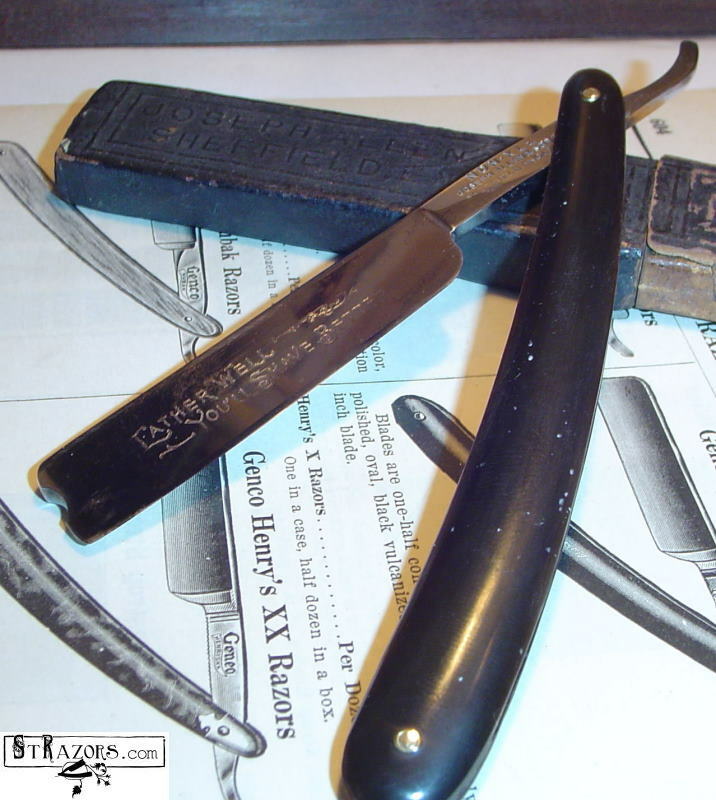 In 1883, Joseph Allen & Sons acquired the "NON-XLL" mark from Unwin & Rodgers, which he stamped on the razors and other cutlery. A lot of Allen's knives and razors were often exported to America. The US firm Adolph Kastor also paid Allen a royalty for the use of its "NON-XLL" mark, because of the resemblance to Wostenholm's "I*XL". Joseph Allen died on 22 November 1893, aged 65. By then, Allen's had moved to Ecclesall Works, No.245 Rockingham Street. At the turn of the century, the business was managed by Joseph Allen and James Edward Allen, the sons of the founder. 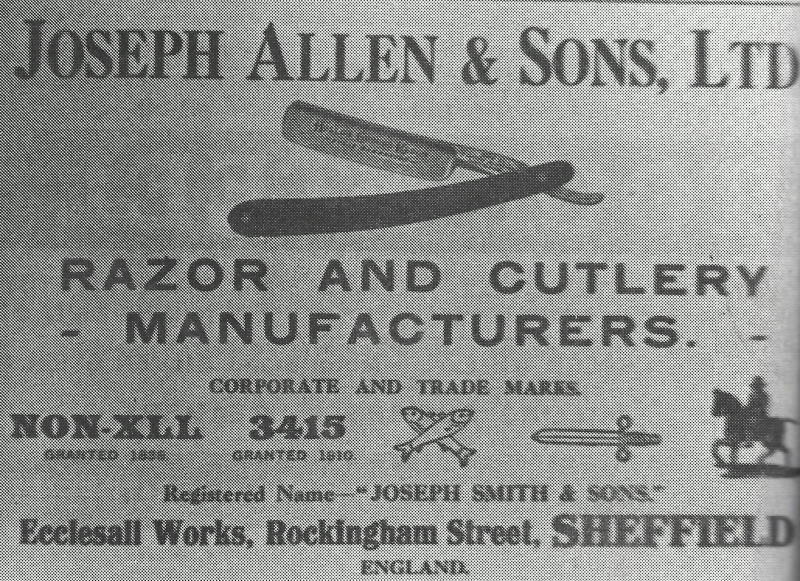 As the traditional razor business declined after the early 1900s, Allen's switched to other cutlery and acquired additional trademarks, including a picture of two crossed fish; and a broadsword (with the word "Sheffield"). Before the WWI, its advertisement showed other marks, such as a man on a horse; and "3415". The latter had once belonged to Joseph Smith and the year it had been granted(1810) evidently gave Allen's a founding date. Allen's later acquired, inter alia, the pistol-heart mark of Jonathan Crookes, Horrabin's phoenix, and the batsman(pic.) mark of Levesley Bros.
By 1919, Joseph Allen & Sons was a limited company. The chairman, Joseph Allen, died on 25 November 1917, aged 58. He was also chairman of H.G. Long. Henry Robert Hounam was a partner in Allen's untill about 1921. Joseph Bingham Allen was the managing director of Allen's when he died, on 18 April 1931, aged 44. The company was liquidated in 1933, but was listed in directories until 1959.